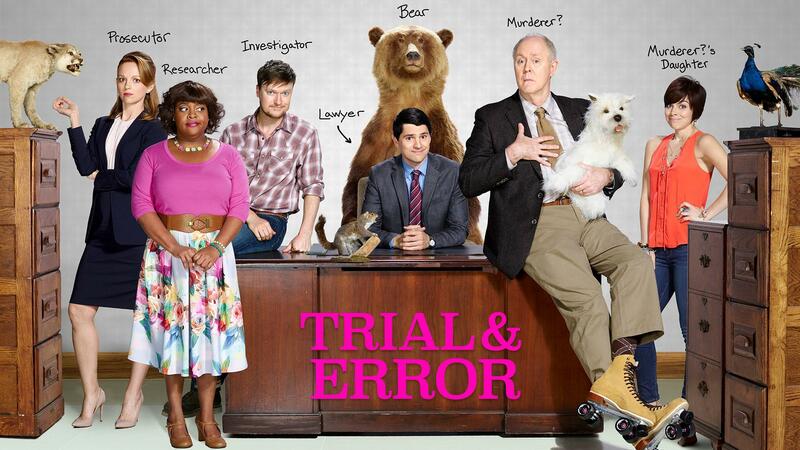 Exhibit opens showcasing ‘Trial & Error’ star’s talent for drawing as well as drama. 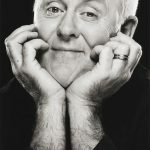 John Lithgow entered Harvard in 1963, intent on becoming a painter. As Shahn well knew, Harvard was then no place to receive formal training in the arts, either visual or dramatic. But the absence of an academic program in theater made for a thriving scene of extracurricular creativity. 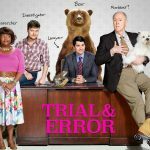 Almost immediately, Lithgow fell in with the theater crowd. He auditioned for and landed a major role on the mainstage of the Loeb Drama Center—the only freshman to be cast in the show. 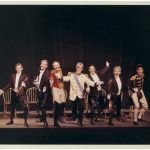 The next fall, during a performance of Gilbert and Sullivan’s Utopia, Limited, a forty-second ovation changed his mind for good. He would become a professional actor. “The dreams of an artist die hard,” Lithgow admits. Still he continues to paint and draw. 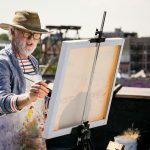 One of his canvases even makes a brief appearance in the film Love is Strange, in which Lithgow plays a struggling gay artist. 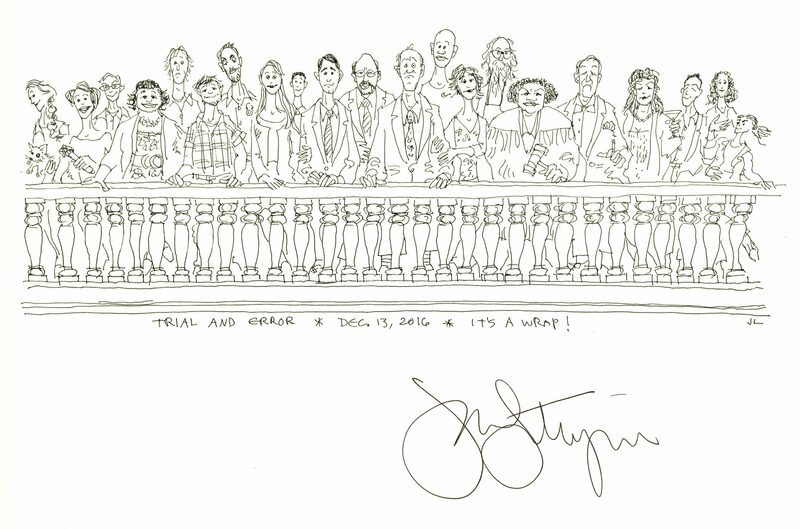 Ever since his early years on Broadway, the actor has presented his fellow cast members and crew with an inscribed caricature on opening night or at the end of filming. 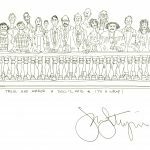 A selection of these drawings, curated by Dale Stinchcomb of the Harvard Theatre Collection, is now on display through July 29 September 7 on the ground floor of Houghton Library. 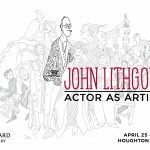 The exhibit spans Lithgow’s decades-long career, featuring artwork from undergraduate productions to his most recent role in the NBC mockumentary Trial & Error, including unforgettable performances in M. Butterfly, the hit sitcom 3rd Rock from the Sun, and Netflix’s The Crown. More on Lithgow’s Harvard years—”the most active and creative” of his life—in an upcoming post. 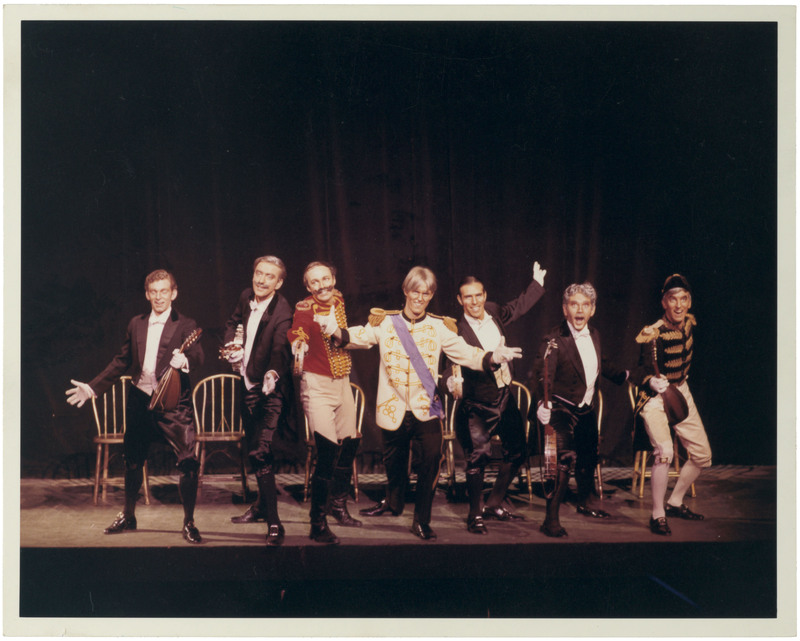 Dale Stinchcomb, Curatorial Assistant in the Harvard Theatre Collection, contributed this post.